A page from Liber Actorum, the yearbook of Boston Latin High School from 1993, is displayed on the computer screen of Tim Bigelow, manager of the Internet Archive at the BPL. “Let’s see who’s next,” Tom Blake said as he walked across a darkened room in the basement of the Boston Public Library to a cart pushed against a wall, its shelves stuffed with yearbooks. He tilted his head to the side to read the spines on the cart. They’re next. They’re the town whose teenagers and ex-teenagers are about to be immortalized forever. If you went to high school in Massachusetts and believed/hoped/prayed your high school yearbook would stay buried in the attic forever, the Boston Public Library has some news for you. It’s going online. It’s part of a project to find and digitize as many of the state’s historically significant documents as possible and make them available online. The Boston Public Library, which serves as Library for the Commonwealth, put out a call to librarians in cities and towns across the state to send in anything they thought needed preserving, offering each about 15,000 pages of free digitization. And those librarians responded by sending in . . . yearbooks. Carloads of yearbooks. Blake, who oversees the project as the library’s content discovery manager, was shocked at first. But there was a reason for that, he soon learned. Librarians reported that the local yearbooks were the most used items in their collections, and also the most vandalized. “People were constantly cutting out pictures of their high school sweethearts,” Blake said. They were also essentially irreplaceable; there was no publisher to call for a reprint. And so yearbooks it was — mostly high schools, but with the occasional college and middle school thrown in. 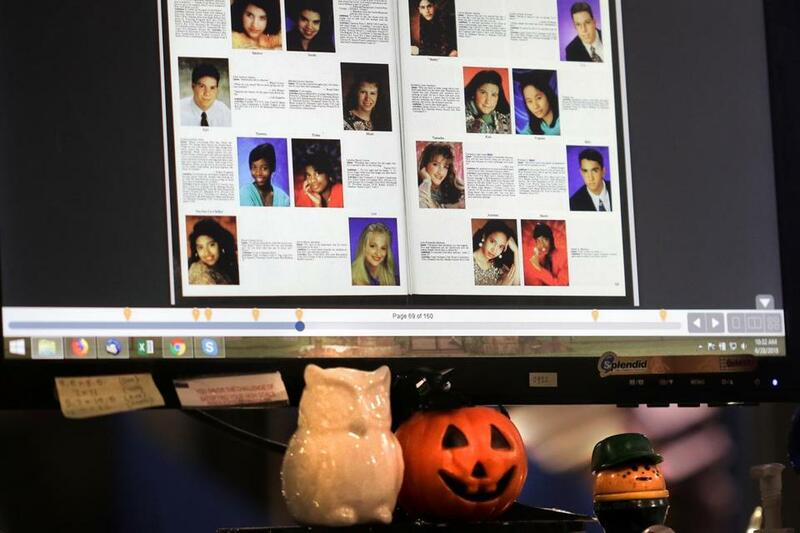 So far, they have posted yearbooks from nearly 140 schools, with more being added as the collections arrive at the digitization lab at the Copley Square library. The digital yearbooks are then published on archive.org, the website of the nonprofit Internet Archive, which is working as the library’s partner in the project. The easiest way to find out if your high school hairdo has been scanned for posterity is to do a Web search for “Internet Archive and” the name of your high school. Thus far, Massachusetts is the only state to undertake such a yearbook project, Blake said. Including yearbooks, Massachusetts’ digitization effort has, since 2010, preserved more than 600,000 items on DigitalCommonwealth.org and another 85,000 on archive.org. Most items are what you’d imagine. Historic letters. Diaries. Ships’ logs. Town reports. But the yearbooks, while full of the novelty of long-forgotten high school high jinks, are not without potential for historically significant big-picture research, Blake said — for they contain data not easily captured in words. A few years ago, researchers at Brown University and the University of California, Berkeley collaborated on a research project using 37,000 yearbook portraits from 1905-2013 to study the evolution of smiles in photos. By analyzing lip curvature, they determined that the smile has been steadily increasing over time (except for big dips in the mid-’60s and mid-’80s); that women smile more than men, and are smiling more now than ever; and that men, who took a while to recover from that ’80s decline, are now near their previous smile high of the mid-’50s. While no one has yet to undertake any serious scholarship of Massachusetts’ online yearbook collection — which is free and available to all, per the library’s mission, the staff members going through the dusty tomes have observed plenty to take note of. Sitting at a work station cloaked in black drapes, with a camera and bright light mounted overhead, Armand uses a foot pedal to raise a v-shaped piece of glass, flips the page, then lowers the glass again for the next photo. It takes about 30 minutes to do each yearbook, and while it can be monotonous, there are certainly things that make her stop and take notice. Many yearbooks have handwriting in them, some of which is interesting; it can also be inflammatory, so she reads everything jotted in the margins and flags anything offensive. Then there are the odd ones — in one yearbook, someone had gone through and written the cause of death next to each deceased person. The quality of the publications, especially in the digital age, has risen substantially, as student editors have access to higher-quality cameras and design software. The library has received some yearbooks from the late 1800s from Newton, but most schools seemed to begin creating yearbooks in the 1920s, Blake said, and for a while they were very simple — names and black-and-white photos, a basic record of who went to the school. He ran his finger along, searching, until he found his personal favorite year, and then he smiled. “1969!” he said as he pulled the book from the shelf. “They’re always very conservative until you hit the late ’60s, then they just get wild in the ’70s,” he said. Yearbooks by their nature were always intended for immortality, to forever capture moments that would never come again. But it was a time capsule kind of immortality, meant to be stored away in an attic. They were never meant, according to some, to play in the harsh light of the Internet. Did Shawn Reynolds, North Andover class of 1993, ever expect the fact that he was voted class clown and most talkative to find its way on to Google? Does the world really need to know about the time, a quarter-century ago, when Mrs. Rasmussen’s zipper was down and he told her in German? It’s just further out there. Forever, only a click away.